What an absolute brilliant list! We have just released a new version of our JobFinder App into Apple for approval so this list is very timely for us. Thankyou. I loved your blog post on the 50 ways to promote your iPhone app – I don’t even have one, but I thought the comments were astute and focused and most could be applied beyond just iPhone apps. I scraped it and stuffed it into our ongoing digital files. I’m currently working on spreading the word and developing a social media game plan for a manufacturer of a narrowly-focused line of machines in a tremendously narrow segment and some of these ideas have spurred conversation internally that may help at least describe the outside of the box to the client. Thanks for a great article. You definitely put a lot of work into this. I am keeping this as a reference to work from when our iPhone App is ready to be sold. Terrific article. And clearly a lot of work on your part. Thanks for sharing. 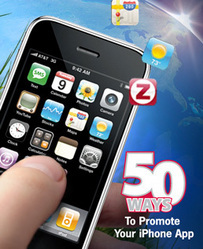 Tmothy – This article is a concise and thorough how-to to create, market and profit from creating iPhone apps. Or, as I would subtitle it, “From Obscurity to Financial Success With Apps.” I found the article incredibly interesting and loved suggestions 17 (who knew there was such a thing as Mobile Barcoding and its’ capabilities? ), 11, and 4 (a good visual). I’ve already sent it to a very good friend who is in the beginning stages of creating an app and I know he’ll greatly benefit from your thoughtful article and appreciate your generosity in sharing so much. Much appreciated. Tim – I keep referring back to this article. What a terrific resource. Thanks so much for enlightening us with this valuable information! I’ve tweeted this and shared it on LinkedIn. Can’t wait for your next post. I’m also adding you to my blogroll…thanks again! Very useful indeed, thank you. Thanks for this article! very helpful. After just putting our first UK job search in the app store, I had no idea even where to begin with the marketing of it. Thanks! AWESOME article – just what the AppDoc ordered! I appreciate your time in compiling this – Rock On! The bible of mobile application marketing! We have been working on marketing our first aid application and your tips have been helping alot! Thank you again for your help. This is a very comprehensive and informative blog. Thank you for sharing, the information is invaluable. Probably one of the better blogs I’ve read on any topic in awhile. I found this to help with my work we had followed a lot of your advice already but this helped me focus on the things we needed to do, it is nice to know that there are people like you who will help and share this type of information. Novel App idea! Always great to hear from our friends in Italy! My dad’s side is 100% Italian. Thank you for your feedback and best of luck with your App. Great info. It has been super helpful – Thanks! You’re most welcome. Glad to help out! My profession is an online marketer and this infomration you complied was really well thought out. It was very helpful and provided some new ideas for the app I just submitted and got approved via Apple. I have an app called Spuzzle (a “social puzzle” – http://www.spuzzle.com/app). I love the name, Spuzzle. Clever concept and I like how you integrate the share on Facebook and Twitter options. Congrats on your Apple approval. I wish you much success! Thank you for the feedback, Ziv!! Thanks a lot for all those amazing tips. We are developing a lot of different apps and all this info is really worthy for us. I am going to get a really big MMMM fan! If you come to Madrid some day, let us known please!! Thank you for your kind words! I’ve been to Madrid and rented a scooter. I had a great time. The scooter was a great way to see the sites, though a few of the major intersection hubs were a bit dicey. Best of luck with your app launches! New iphone puzzle app submitted to app store..
You’ve got some great artwork! I wish you well with your new app! The best on the web! Worth a million. Hello there. Glad you found the information helpful! Thanks for the post, Tim! Very helpful and I came across it at just the right time. I’ve bookmarked your blog and I look forward to reading more. Please say hello to the folks at BR for me! Thank you for your note! Fancy meeting you here. Next time you’re visiting BR, please stop by to say hello! All the best for a successful iPhone app launch! I am on searching best tool of promotion App! !,too much pleasure to meet these post. thanks for the great article,,, learn so much from your site. This worked for my iRipped gym application. I increased sales using this guide thanks. My app was great but no one heard of me! These are really amazing tips. I’m a young iOS developer in Vietnam and don’t know how to market my young apps. But your tips makes the world flatter. Hey Tim, great piece of work. As I am new in marketing of android and apple apps and this will help me a lot to overcome the issues I am facing from past few days. Thanks a lot this kind of information is what I was looking for. People like you make me want to give back. Keep the good work. Thank you kindly for your encouragement. And your note makes me want to do more! Excellent article. I think marketing is just as important as (maybe more) application design and programming. There are so many apps now in the app store it is hard to stand out . Creating pre-launch hype and building a list is also very helpful. Yes, Mark; with over 350,000 apps in the Apple App Store, it’s critical to do the pre-launch tactics and execute a well thought out plan! Thank you for your feedback! Good Article. App marketing is very important, especially in a low barrier market as the appstore. There are many good apps and games for concept and design that can’t be found and bringing the news of a new app to a large audience is the second half of the job. The first is development. I think these 50 points are a must and sign the road for a better marketing plan. Thanks Tim for the article, I’m trying to follow your points and the presentation on SlideShare has been the most useful tip so far for my just released app about Euro coins. Hello, Davide, from the USA! Your Euro coins app looks very helpful. I’ve got an American coin collection and I’d love to have access to the kind of info you share in your helpful app. Best regards, Tim. Thanks for an extensive idea list! This will help, do you have any content more recent or comparisons on how promoting your app has changed over time? Becoming a BIG fan! I found particularly useful the one about SlideShare. Glad to know Italy is one of your favorite places. Hi Tim, Thanks for the killer info. We are in our late development stages, and even though we started marketing efforts long ago, I’ve been searching for something like this for a long time! Will definitely use most of these, and as Francesco said – its 50% (at least) Marketing. Great tips for our app launch plan! Thank you, Tim! By the way, is there any update or new one in these 2 years? I have definitely reviewed and resulted in the cpa becker from Morgan to be the best pick. Will consider your advices. Thank you. very nice list.but i m little confuse about bar code.plz explain it…. Great article. There are many items on the list that I would have never thought of or have seen previously on any other app promoting website. I will be using many of these ideas to give my app (“Radio Dial Word of Day” – Radio Disney codeword) a boost in the app store. Thanks, Tim. “50 ways” thats definitely worth implementing not only for the iPhone but other parts of marketing products of the business as well. Just stumbled across this article and I’ve enjoyed reading it! we just recently lauched our app and we use most of the items here. the main items that helped us penetrate the market were Blogs coverage of our app and using PR agency. another tool that we used which I didnt see here is the buzzdoes tool (http://www.buzzdoes.com) which actually generate many new users from our early adapters. it works in a risk free manner – where you don’t pay anything unless it work for you, and for us it works really great. a question – do you think we should use different marketing methods for the android market and the Apple app store? thanks and keep on writing great stuff! May I simply just say what a relief to find somebody who actually knows what they’re talking about online. You certainly understand how to bring a problem to light and make it important. More and more people have to look at this and understand this side of the story. It’s surprising you are not more popular given that you surely have the gift. truly enjoyed surfing around your blog posts. In any case I’ll be subscribing to your rss feed and I hope you write again very soon! That is a very good tip especially to those new to the blogosphere. Simple but very accurate info… Thanks for sharing this one. A must read article! Great list. We just launched http://www.zummii.com. Thanks. Thank you; best wishes on your new customer feedback app! Great article! Most of the ideas you presented are great for marketing pretty much any type of product or service. Previous Previous post: What does the future hold for smartphone mobile apps? Next Next post: Mobile Monetization: Is a Mobile App Right for Your Business?